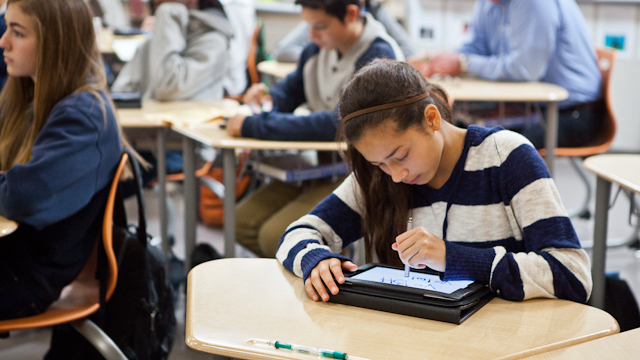 What Will It Take for iPads to Upend Teaching and Learning? Students at Hillview Elementary School use iPads in math class. As schools across the country consider which devices to invest in, they must first consider their big-picture vision for how they'll be using these devices -- and to what end. They must consider the needs of teachers and students, and come up with a shared understanding of their goals. When it comes to choosing tablets, educators have a lot of anecdotal information to weigh, and many are making these decisions with their eyes wide open. But no one example of school tablet use can be a set model for every scenario. Each principal, each school, and each community has their own set of needs and criteria, so what might work in one school may not work in another. Still, educators and administrators are learning from their experiences, and are continuing to refine their vision, as they set expectations for what they want to achieve -- ideally beyond higher test scores. In our continuing coverage of tablets in schools, we're seeking to document the questions and complexities that come up as teachers, administrators, and students find what works and what doesn't. To that end, we visited Hillview Middle School, located in an affluent Bay Area suburb in Silicon Valley, which is now in its third year of piloting iPads to each student, grade by grade. Principal Erik Burmeister has led the effort, consulting closely with EdTech Teacher, which puts on the annual iPad Summit, to help define those amorphous, complex goals. But even with this fairly sophisticated level of knowledge and expertise going into the iPad pilot, Burmeister has no illusions that, at this point, the iPad program is doing more than just "enhancing" classroom learning. That is, it’s helping with homework management, organization, and other logistics, but the introduction of the device hasn’t yet become transformative, which is his ultimate goal. So what does "transformative" mean to Burmeister? "I no longer have to be the bottleneck of information for my students. I actually can be the person in charge of creating incredibly deep and broad learning experiences for kids and giving them the tools to find that factual information themselves," Burmeister said. "My job is to ask powerful questions. My job is to create learning experience that gets kids engaged in a way that me just pouring information into them so they can memorize it and regurgitate it back to me is long gone. My job now is to get kids excited and give them the tools to be able to access the knowledge to be able create, to be able to analyze, to be able to compare and contrast, to be able to synthesize and to be able to design new things out of the learning that they’re able to access via a touch of a button on the iPad." That's a tall order. Letting students take ownership of their learning may be at the heart of what Hillview hopes to eventually achieve, but getting to that level of transformational learning takes letting go of control on the part of teachers and administrators. And that’s where it can be tricky, even for a school like Hillview that’s committed to the idea of the iPad as a “positive disruptor” -- a force that will require them to think about change. Eighth-grade math teacher Michael Doroquez was an early tester of the iPad and has been using the device for the past three years. Doroquez uploads the day’s notes onto the education social networking site Edmodo, where all the students can access them on their iPads. He’ll explain or review a skill by projecting the worksheet onto the whiteboard and then break students into groups to practice. They work out problems by drawing on their iPads with their fingers. Later, they can turn their work into Doroquez through an app called Notability. “I kind of can’t live without it because I use so many things on the iPad,” Doroquez said. To that end, the iPad is a great utility tool. But for the most part, students aren’t doing anything on the iPad that they can’t do with pen and paper, although admittedly it's much faster and more efficient to use the iPad. Instead of working on a paper worksheet, they’re filling out a digital one and emailing it to their teacher. The real gains are in organization and efficiency -- an easily searchable archive of notes and past work or the ability to quickly email teachers with questions. Math teacher Michael Doroquez works with students. Seventh-grade teacher Michael Kalen is still experimenting what will work best in his English class because his students just got their iPads. To start with, he wants them to see the device as a powerful learning tool, not a toy. “I need them to see that this iPad is a powerful learning resource for them to get where they need to go,” Kalen said. Before the school went one-to-one with iPads, Kalen sometimes had access to a shared laptop cart, but he couldn’t depend on it being available for every lesson. He’s excited to come into class, have kids open a home screen on the iPad and be ready to go, no intermediate steps or time lost. He expects to use apps like Socrative, a real-time polling app, and is already thinking about ways to get students practicing various parts of the writing process, like brainstorming, through different apps. In a small French class with only five or six students, the teacher helped her students familiarize themselves with their new iPads by screen casting a vocabulary exercise on the board. As students responded to the prompt, their answers popped up on the screen. The teacher could instantly see who understood her question – asked in French – and who was confused. Students also got immediate feedback on their answers and the class could discuss common mistakes. Later, the teacher asked students to draw iPad sketches of the scene she described in French. Students were able to share their drawing with one another through the screencast, an especially useful too if the class had been bigger. For the most part, the teachers interviewed at Hillview are excited about the iPad program, but many are still figuring out what works. “I need to be more efficient with what I’ve got and I need to be more effective because the stakes have never been higher,” said English teacher Michael Kalen. Even without iPads, Kalen is one of those charismatic teachers that brings so much enthusiasm and humor to his subject that it's hard to imagine any device would make him better at his job. But with Common Core State Standards on the near horizon, Kalen is worried about his ability to use class time efficiently. While the new standards cover less terrain, they expect a more comprehensive knowledge, Kalen said. He expects the iPad to put him on the same page as his students quickly each day, with no wasted time, but that doesn’t mean he’ll be sacrificing any of the teacher tricks he’s already learned. “It’s still about the relationship,” Kalen said. “It’s still about building that creative confidence; it’s still about getting kids to push themselves. And that’s what I'm hoping this iPad will let us do.” Kalen is most excited that students might feel inspired by the technology to demonstrate their knowledge in different ways. “What I'm really enjoying about it now is that the products that kids create might all look very different, but the thinking and the synthesis of the ideas are all getting them to the same place,” he said. Math teacher Michael Doroquez is also trying new things. This year when he gave a geometry review he turned it into a scavenger hunt with QR codes pasted around the school. “The kids loved it because not only were they able to leave the classroom, but they were able to work with each other outside the class setting, and used the iPad, and walk around the school and do problems,” Doroquez said. Still, the iPad has some limitations. “I really want the iPad to be a tool for creating,” Doroquez said. “Right now it’s just a receptacle to take notes.” He expressed frustration at the limited apps available to him and at their cost. He wants to be more creative, but he’s having a tough time getting there with the iPad. He complained that it is often hard to get outside data onto the iPad, like music for a video, for example. Big tech companies like Apple, Google, and Adobe all make products that work in separate ecosystems and aren’t compatible with one another, making it hard for Doroquez to find the right resources to expand how he teaches. English teacher Michael Kalen explains how the class will be using iPads. “I think right now we’re really focused on the enhancement piece, but we’re excited to talk about the transformation piece,” said principal Burmeister. The efficiencies afforded by putting notes online or submitting work digitally are good steps forward, said Burmeister. He’s aware that most of his teachers are still exploring what can be done with the iPad and that some are further along than others in moving towards the kind of learning he’d like to see. But he’s willing to be patient. “Everybody knows where we’re trying to get, but how each individual gets there and the speed at which they get there is different for every teacher,” Burmeister said. One simple way that iPads are moving beyond enhancing and towards transforming learning at Hillview happens when students take notes on their English and social studies texts. With paper textbooks, kids aren’t allowed to annotate what they’re reading because then the book can’t be used the following year for another student. "It’s being able to engage with the material in a really kinesthetic way,” Burmeister said. “The material is so sacred that it’s not sacred, you can really dirty it up.” Students appreciate this new ability too. “It makes it a lot easier to study for quizzes because we can more easily find what we were going to say when we read something,” said eighth grader Jenna Filbin. Keeping that network running costs hundreds of thousands of dollars, but in addition, each iPad costs about $600, including the apps Hillview has chosen and keyboards. Burmeister is quick to point out that for that cost Hillview is already set up to have every student take Common Core assessments at the same time and that the costs of paper textbooks offset some of the initial technology investment. Hillview was able to go one-to-one because 10 percent of its operating budget comes from a parent-funded foundation, a luxury not all schools can boast. “Over time, what you’re going to see is that not only are we enhancing these kids' education, but we’re actually transforming it,” Burmeister said. “And it’s actually going to look different than it looks now.” Moving to Common Core offers the opportunity to dramatic rethink teaching and learning. There’s no better time to shake up how teachers are thinking about their craft, Burmeister said. “We want learning to be technology infused and digital learning to be just who we are, what we’re about and what our students can do,” Burmeister said. As the rest of the nation looks towards these kinds of investments, Hillview hopes to be positioned as a shining example of how to successfully pilot and implement a one-to-one program.